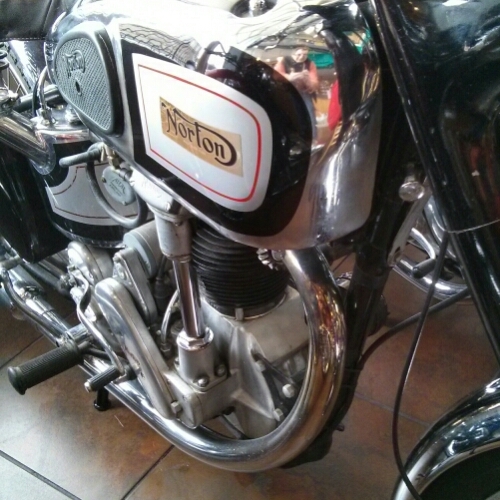 …next to its standard Trident brethren. Nearby its papa M30 International. Black & Silver monochromatic corker. 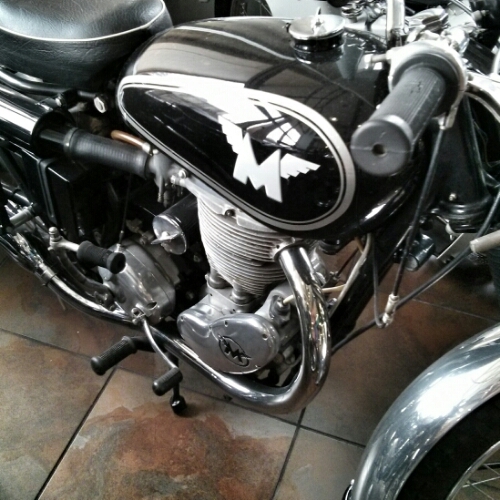 Matchless. Clean. Stout hearted. G80. The cats whisker. 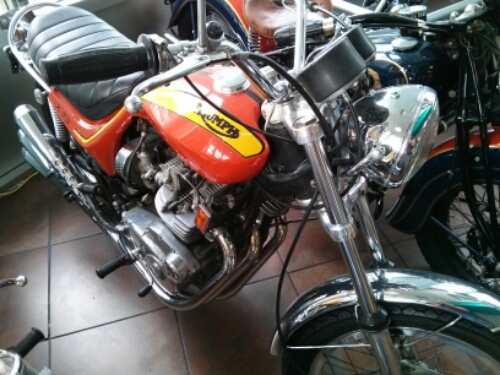 A Panther M100 Redwing. Distinctive by its sloper engine. The collection belongs to Al Philips. An alcove behind the entry foyer had the hat trick. 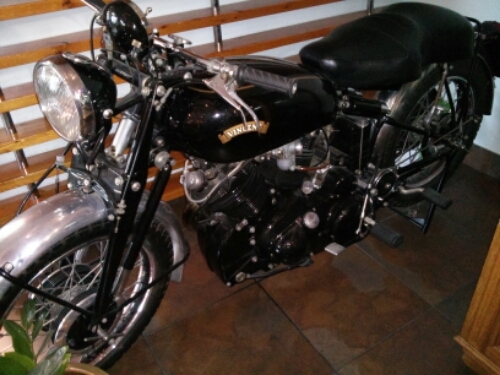 Three Vincents… Here’s the superlative Black Lightning. Weekend here! Time for a lie-in methinks. The big triple makes her look kinda wee. Camilla Parker Bowels (spellchecker correction for Bowles). 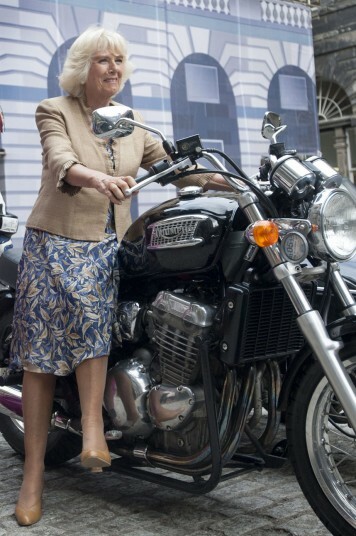 Duchess of Cornwall to the denizens of Blighty. 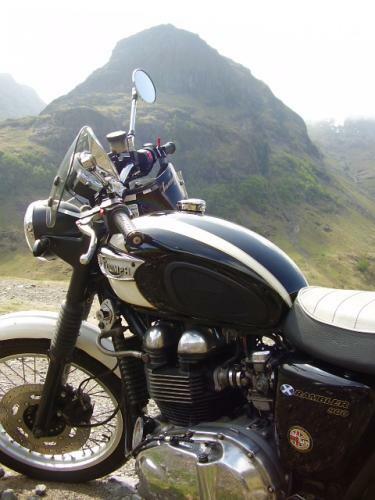 Chaz likes his motors, in particular Aston Martins, but here’s his gal on a mighty Triumph. Albeit sidesaddle. Diana? We know the story of the paparazzi on fast Beemers, a Paris tunnel and a nation in mourning. Here she gives the lads biking inspiration for a future of motos which they both share. Wha’? A pair of twins side by side to make a four. 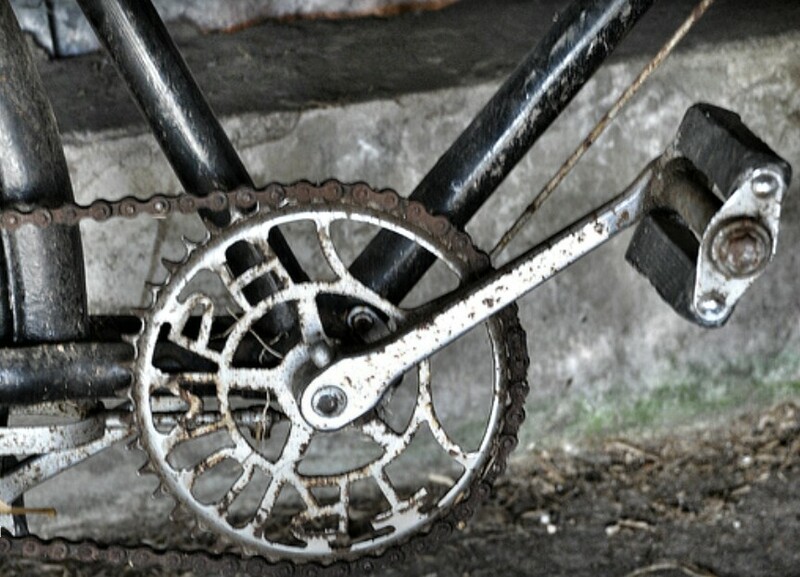 Unique engineering to link cranks and set up valves and timing. 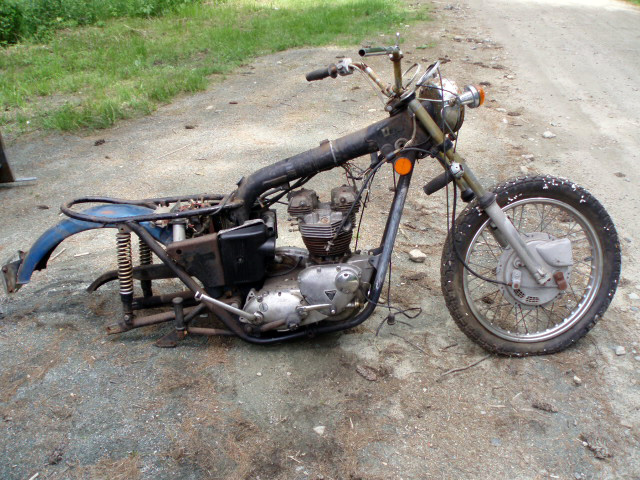 1300cc and a fifties frame and sixties brakes. Wobbly at speed I’ll bet! 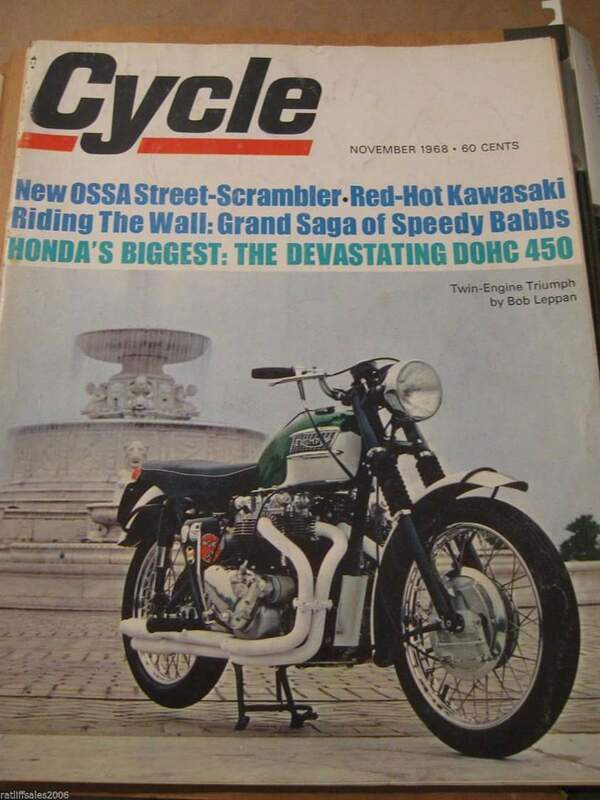 About this time Honda’s CB750 was quickly being cleared from the showroom floors. 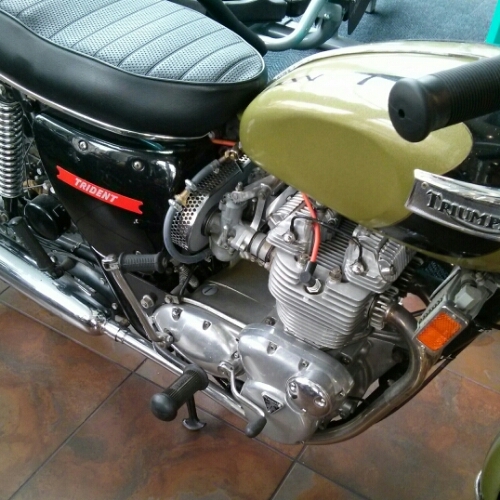 This Triumph was of course a one off so it was up to the factory triple Trident to go up against the Honda. 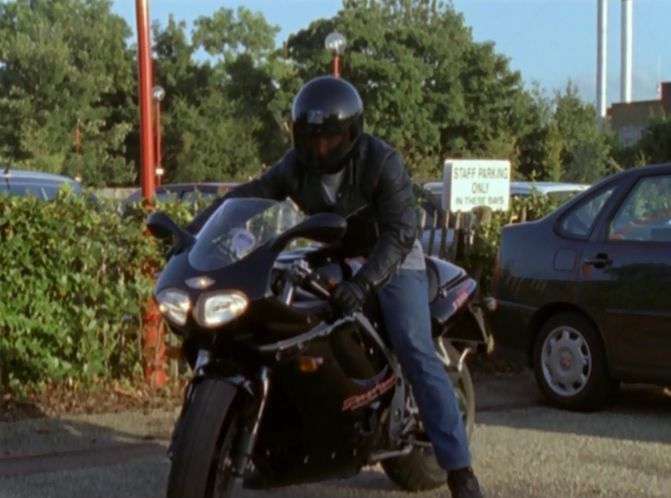 Watching an older episode of the Yorkshire police show Dalziel & Pascoe one of the characters, who also works down what must be one of the last pits, rides a late 90’s Triumph T595 Daytona. 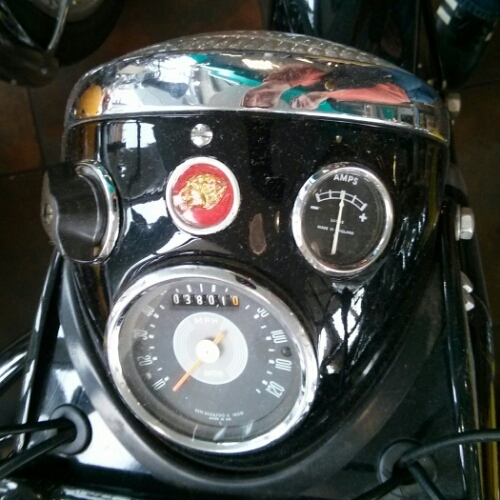 He’s a main suspect so being a stereotypical rowdy biker maintains suspense. 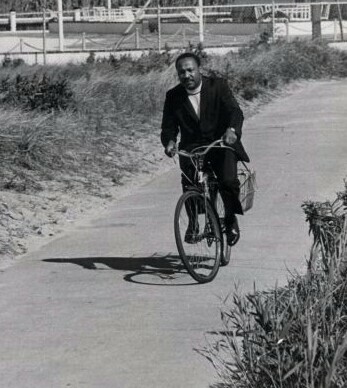 He wheelies along colliery row houses and near allotment gardens. Grumpy Dalziel (PR. 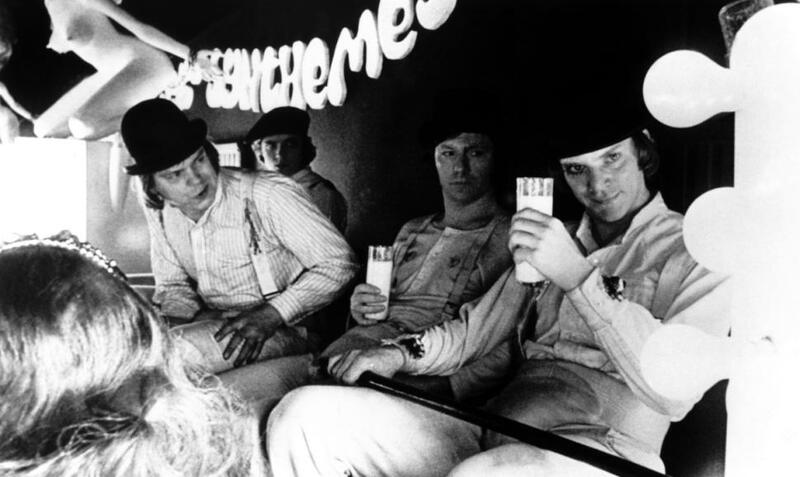 Dall eel ) is played by the late Warren Clark. 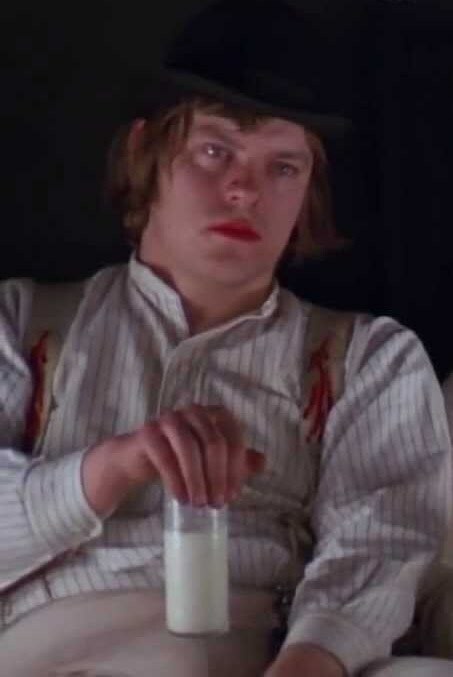 Starting his career as Dim in A Clockwork Orange. Going through tough times. In need of some rear support to gain traction. No gas in the tank, indeed no tank. Saddle-up? Well, no saddle. Flat tired. Rusty around the edges as well as middle… And underside. Wiring loom needs reweaving. Amal is AWOL. Seen better days. Would like to enjoy retirement. Or willing to be organ or limb donor! 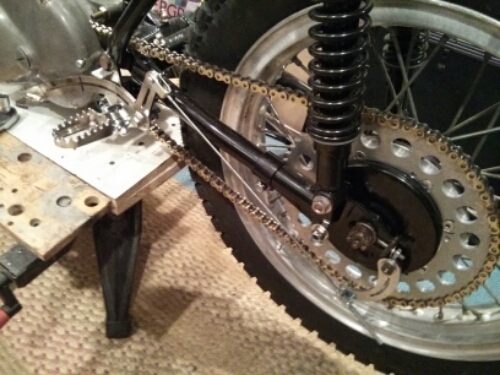 Chain slung over the new whopping sprocket. All 66 teeth on it. To ensure it wouldn’t rub against the hefty trials tire some engine realignment was also accomplished. Just need 3 new high strength 3/8″ engine to frame bolts. The rear brake pedal lever was also given a little more of an s-bend. I spent today drafting planting plans, devising associated details and writing specifications. No ‘phones ringing to distract me! 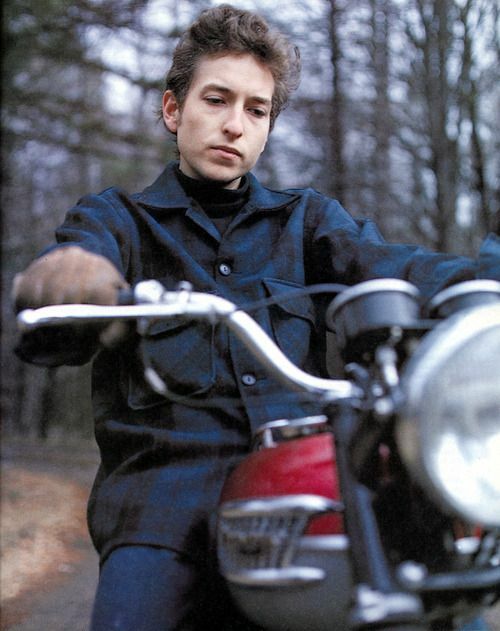 So I put on some Dylan music to hustle the hours along. Worked like a charm! the state of being victorious or successful. joy or satisfaction resulting from a success or victory. a highly successful example of something. 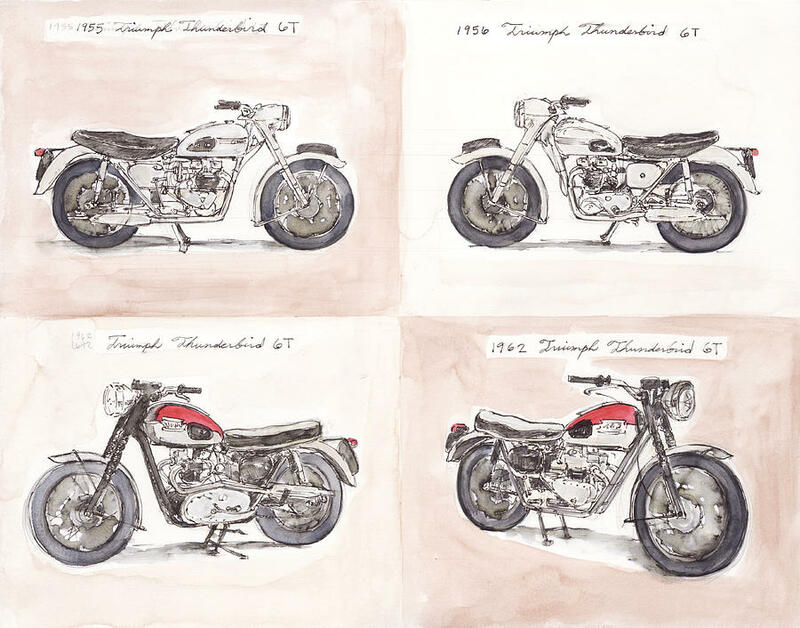 These are the descriptions from a dictionaries of the noun Triumph. What a great word to utilize for a motorcycle, the idea of a journey, its speed and a destination as well as the item itself. It has the vision of some banner fluttering in the wind in regal success. 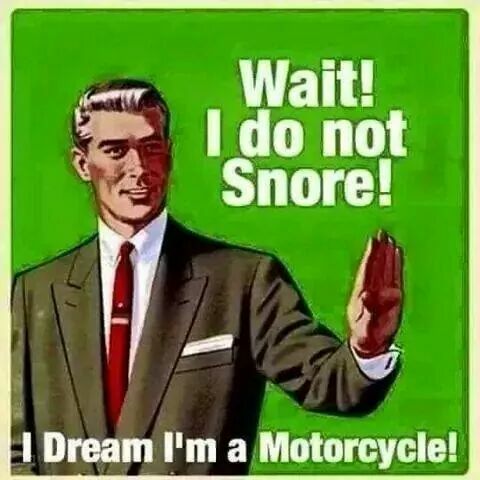 Other Marques are family names: Honda, Ducati Barley Davidson to mention a few. Others the name of a location: BSA, BMW. Indeed few have a moniker regaling a people such as Indian. 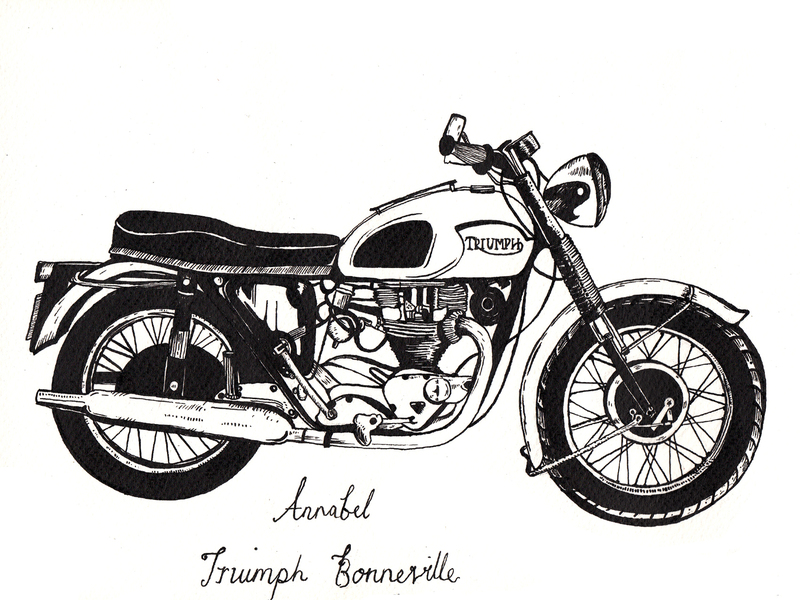 But it’s Triumph that fill you with spirit once your heading off down the road with the mere whiff of throttle. 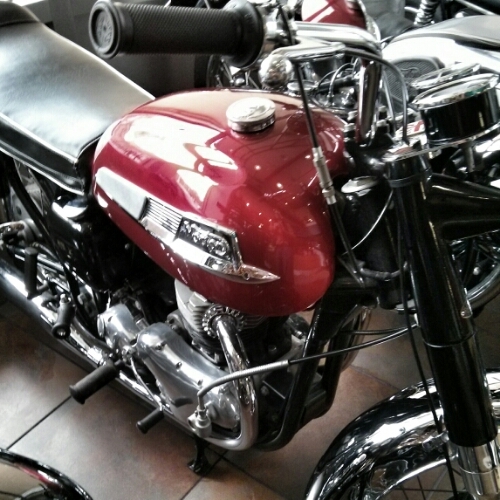 Matchless?…. Victory? Yes, yes, yes. Point taken! Buzz Aldrin turned 85 today. 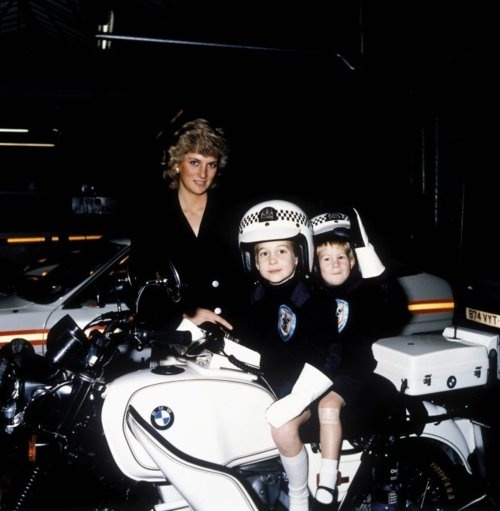 Fighter Pilot, Orbital maneuvering specialist, moonwalker, science advocate and Mars Mission promoter. 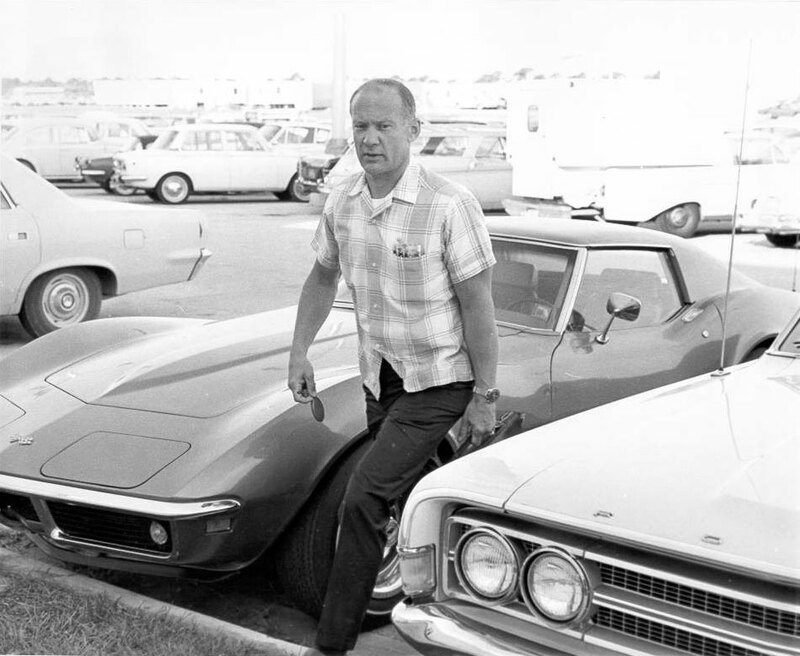 Here he is in Apollo days arriving to work in his small Corvette Stingray coupe smallblock. Well he’s gotta go slow sometimes! Gemini 12. 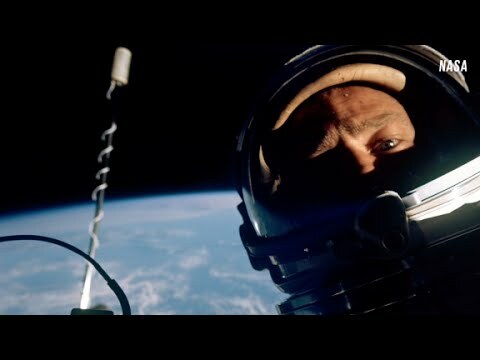 Spacewalking selfie. A life lived rich in history. Splendid line drawing with character of someone’s beloved ride. 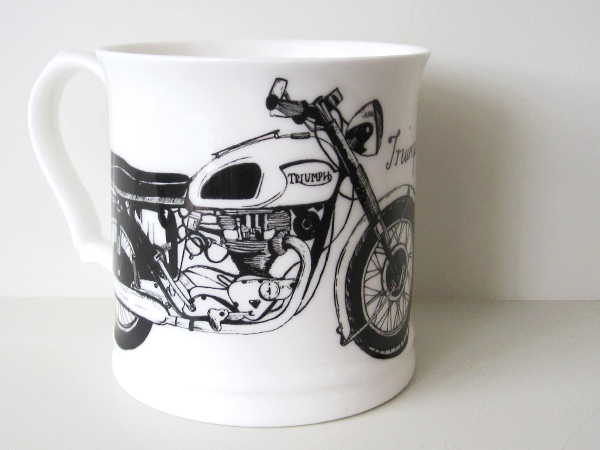 This was a commissioned piece used to adorn a mug created by a ceramist in the UK. Fun little loose sketches by an artist called T Vasco. My style of quick capture. The little hint of red on the ’62 tank adds a splash of color to liven the machines up.